A dozen years later! The book is published. Listen to a CBC Interview with the author. Or here. ̶C̶l̶i̶c̶k̶ ̶o̶n̶ ̶c̶o̶v̶e̶r̶ ̶t̶o̶ ̶p̶u̶r̶c̶h̶a̶s̶e̶.̶ FREE NOW – GO HERE for your copy . READING THE BIBLE: Intention, Text, Interpretation was exactly the text I wanted to bridge the ever-widening gap between the ancient stories and contemporary students. 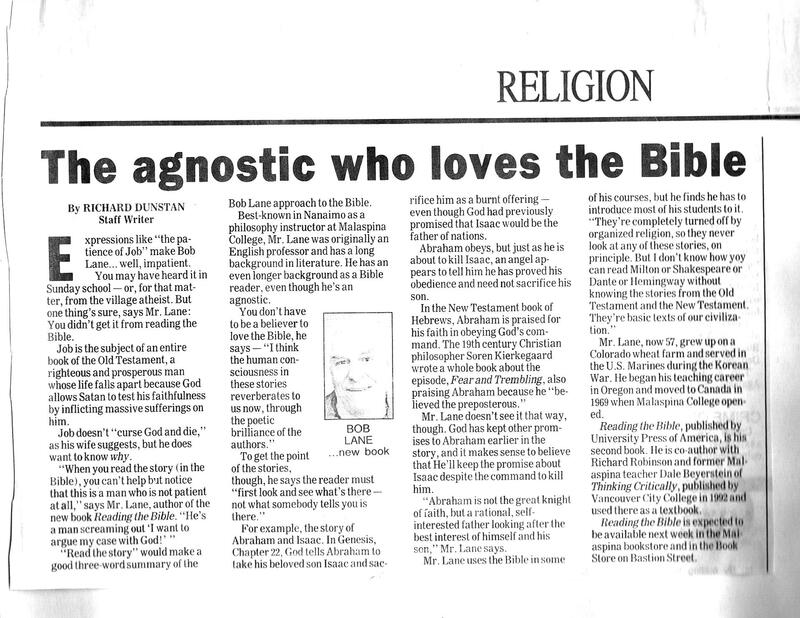 I used the book in a second-year university course which studied the influence of the King James Bible on two 20th-century fiction writers: Howard O’Hagan (Western Canada) and Flannery O’Connor (Southern U.S.). Robert Lane has a unique gift for both interpreting key passages/motifs, and putting them into 21st-century perspective. Virtually every student in the class at some point remarked that this book made it possible to finally understand where much of our modern literature comes from. Lane’s style—a combination of meticulous scholarship and humourous personal anecdote—makes it accessible to all students and does much to correct the woeful ignorance in our society about this critical topic. I highly recommend this text for any university course, including graduate level, which is concerned with the literary, cultural, and mythological aspects of the Bible. The Bible. It has for centuries loomed very large indeed in our society, our culture. So, you have no doubt thought about it, wondered about it from time to time. If you were brought up in a tradition that celebrates the Bible, you may, out of curiosity, have tried occasionally to read it, and each time found it be a strange, exotic, and baffling work. Opaque. As indeed it is for those who encounter it without some preparation. The Bible was written centuries ago, in an ancient culture, with a world view radically different from our own. As a result, there are things you need to be aware of before you can penetrate the veil of time that is draped over it. In addition, most of us find it difficult to approach the Bible dispassionately, without prejudice. We read it through a haze of culturally induced preconceptions (whether positive of negative). The mist that clouds the Bible has been, for both believers and non-believers, a serious obstacle to their reading the text with clear understanding and appreciation of its contents. When we approach it with open minds, with awareness of its historical and cultural context, it emerges as a work with remarkable properties. It is helpful to have a guide to enable you to find your way to the rich rewards the can make available to you. Robert Lane, the author of this book you are now holding, is an eminently qualified and gifted guide. First of all, he has a deep affection for and long acquaintance with the stories of the Bible: he has for many years taught courses (among many others) in the Bible as a literary work, on that he himself found richly provocative to reflect upon, has found to be stimulating in his thinking about the problems and possibilities of human existence. Second, the author approaches the Bible free of any dogmatic assumptions. He is not a believer in the Bible, but rather a lover of its riches. Third, he has a profound knowledge of the cultural context out of which the Old and New Testaments emerged; fourth, he is a trained, practiced, and sensitive literary critic, since he taught English and American literature for many years. Fifth, he has studied and taught philosophy, including logic, for years, and this is reflected in the quality of his thinking. It is at once precise, disciplined, and sensitive. It repeatedly reflects strength in logical thought, in philosophical insight, as well as a high level of literary sensibility. Lane is a unique combination of philosopher, artist, scholar, and literary critic, moved by passion as well as by precision of thought. Even all this, however, does not give a full inventory of his talents. He also taught mathematics to pilots in the US Marine Corps. He is competent at repairing automobiles, at building houses, and is entirely at home in the new world of computers. He is without doubt a fully alive and creative human being. What you have here, in this book, is an author, a guide with an extraordinary range of gifts who will open or eyes to the meaning and beauty caught up in the stories of the Bible, will enable you to use them as an endless source of reflection and insight, not only into the human adventure but also into yourself, your own person, set down in the context of this larger adventure. Consider, as an example, the provocative distinction Lane makes between official line and story line, that is, between the accepted world view of the writers of the Bible, the set of generally accepted assumptions from which they worked, and, on the other hand, the lasting contents of the stories themselves, their history and philosophical merits. This pair of ideas (among a great many others in the book) is likely to open up congenial pathways for you in the thicket of biblical narrative, and traveling along these paths will undoubtedly enrich your awareness of the world and yourself set down in it. Available to read free online.